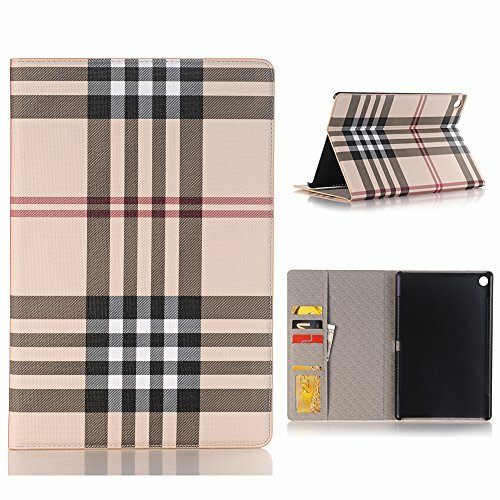 This Infiland case specially designed for Huawei MediaPad M5 10.8"" Android Tablet 2018 release Only. Not compatible with Huawei MediaPad M3 8.4 or other model Huawei device. a.This case for the new tablet is made from luxury PU leather. b.Thus, everybody can pick their own favourite position to watch movies and photos. c.The upper is made from extra soft PU leather. d.The interior features soft flannel which protects the tablet from scratches. e.The display is completely unobstructed. f.The protection of the power switch and volume control is specially devised so that easy operation is ensured. g.This miya ltd new Case is the perfect choice for those who want a stylish and affordable way to protect their Huawei MediaPad M5 10.8 Tablet . - Premium quality soft PU leather provides all-round protection. - Microphone, camera, speaker, brightness sensor and all ports are accessible. - As for leather items, it's normal for the smell in the beginning, just air it for some time, the smell will fade away. ★For your convenience, please search ""Miya Ltd + your product"" to buy the fastest way to get other products you want, and have a clear view of other products we offer in the store. Specifically Designed For: Huawei MediaPad M5 10.8" 2018 Release Android Tablet Only,Not compatible with Huawei MediaPad M5 8.4 or other model Huawei device. Easy access to all features and controls.This case offers full in case functionality and access to all buttons and ports including headphones, volume, mute. Slim lightweight durable protective hardback with premium quality PU leather. Soft scratch-free microfiber interior adds comfort and an additional layer of protection against fingerprints and scratches.perfectly protect your Huawei MediaPad M5 8.4 inch Tablet from knocks, dust, damage, scratches.